I’ve had a passing fondness for steampunk – never been a major fan, but have dipped in and out every now and then. When LADY MECHANIKA turned up, I was willing to give it a go and I was so glad that I did. Joe Benitez’s art sold me on the title initially, although his writing had become better over the years (and I can’t believe it’s been over eight years since this first issue landed) and each of the subsequent mini-series have improved on the preceding one. 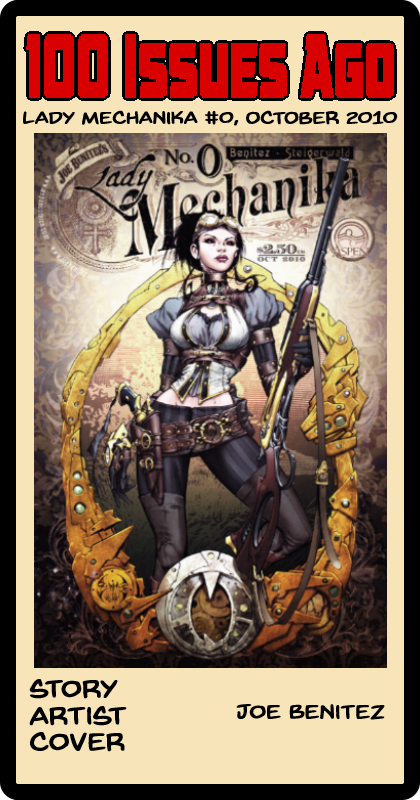 Mechanika herself seems to be moving beyond the initial characterisation of a woman with no memory of her past and a need to find out her origins, and instead has become part of an ensemble cast of supporting characters who are as fully formed as herself. There’s been at least one mini-series per year since 2015 (there was a delay between 2012 and 2015 as Benitez left Aspen and formed his own publisher) and, with a bit of luck, that’ll continue. Posted on Tuesday, February 12, 2019 Sunday, February 10, 2019 by GaryPosted in UncategorizedTagged 100 Issues Ago, Lady Mechanika. I think I remember this either seeing it in a random issue of Wizard or on the comic racks, but the title looks familiar. Never picked it up even though I’m a fan of Benitez’s art. If you like his art, it’s worth a look; most of them have been collected in trades by now.